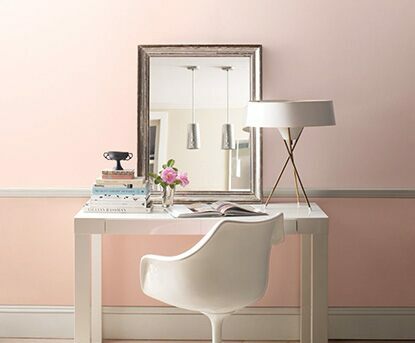 Your choice of home office paint colours can both maximize productivity and ignite your creativity. From efficiency-enhancing greens to high-energy pops of red and yellow, Benjamin Moore fuels home office ideas and creativity. Push design further with clear Notable® Dry Erase Paint over your existing office wall colour, and watch as ideas come to colourful life. With Notable, painted wall surfaces become dry erase boards. Use Notable clear over any wall paint colour, or opt for the classic "whiteboard" white. Notable puts your ideas, to-dos and appointments directly on your home office walls with a glossy, luxurious finish that erases beautifully. Wood, glass, metal or laminate surfaces? Apply Notable® Dry Erase Paint over these surfaces too for ultimate design flexibility. Given at-home diversions, finding focus in your home office is critical. Our favorite non-distracting colours include neutrals, blues and greens. Some research suggests green is an effective wall colour to increase concentration, so consider Guilford Green HC-116 or High Park CC-620. 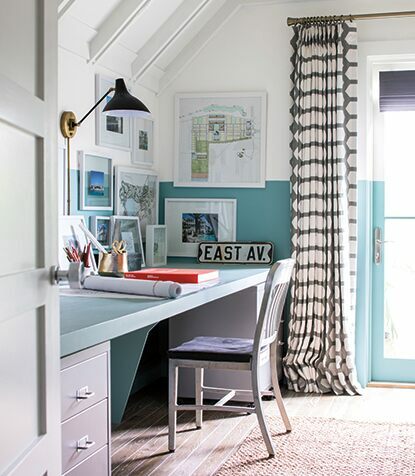 Our favorite light blues for home offices include Blue Danube 2062-30 and Woodlawn Blue HC-147. Light colours are not only calming, but they create great backdrops for pin boards, pictures and shelving without being too “loud” for a space where concentration is important. You can never go wrong with white for a home studio or office, as seen in this crisp office in Simply White OC-117. Accent walls and wainscotting can provide colourful creative punctuation for your home office, library or study. Brighter, more energizing colours we love for the office include Touch of Pink 2008-70, Banana Yellow 2022-40 and Surf Blue 2056-30. Whether your colour choice is warm or cool, as seen in this video, light plays a major role in how colour transforms any room. Use a balance of task lighting and ambient lighting with appealing light temperatures so that the office is equally functional and visually comfortable. Don’t forget to consider the design impact of sheen. Because it reduces glare, a matte finish will produce a soft look that works well in an office. Chairs, desks, cabinets, bookcases or any other office furniture present an opportunity for a higher impact sheen to stand out against classic matte or eggshell walls. If you want shine and contrast for your office furniture, consider ADVANCE, which provides a furniture-like finish in a high gloss. Create your own home office colour schemes—browse all of our 3,500+ colours online to get started!